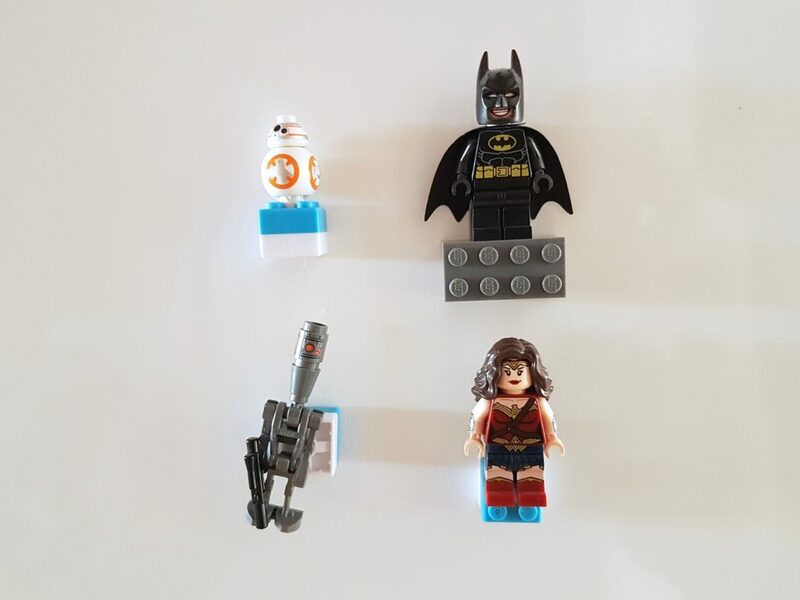 A review from the perspective of an AFOL (Adult fan of LEGO). Mbrik was introduced to me via various LEGO news sites when the maker started a kickstarter campaign to get the product of the ground. 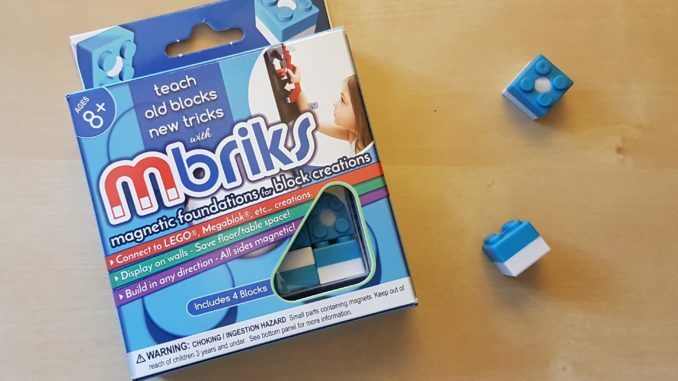 I’m usually not interested in non-LEGO blocks, but I have found the LEGO magnets I use to be lacking and I hoped Mbriks would address their issues. So I decided to take a chance and supported their kickstarter in order to receive a bunch of Mbriks magnets to play around with. Why do I use magnets? 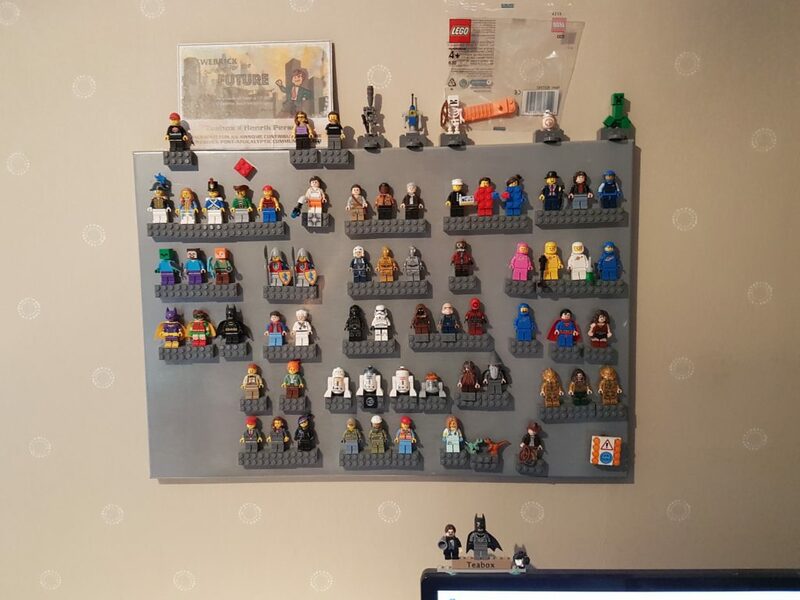 Like many other AFOLs, I like to display my minifigs and I found that using a metal noticeboard in combination with LEGO magnets worked great for me. I can quickly add, remove and rearrange my minifigs whenever I feel like it. And the display doesn’t take up any of my valuable shelf space. But the magnets I use needs additional pieces if I want to place anything without a standard minifig leg piece on it. 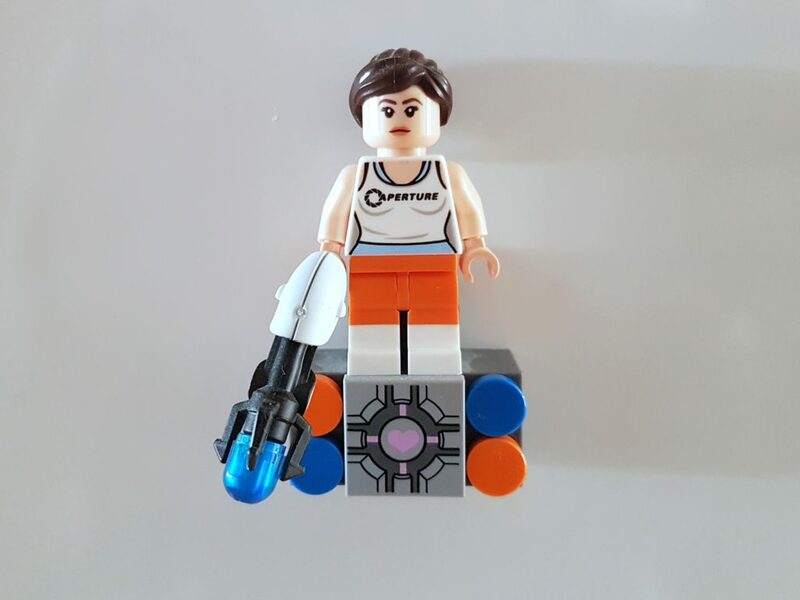 Additionally, if I connect something a bit heavier than a minifig to it, it will start to slide downwards. It was clear by looking at the pictures, that the Mbrik would be more versatile. But it was hard to judge if the Mbrik would be able to carry more weight before starting to slide down. Still I thought it would be worth a trial purchase. 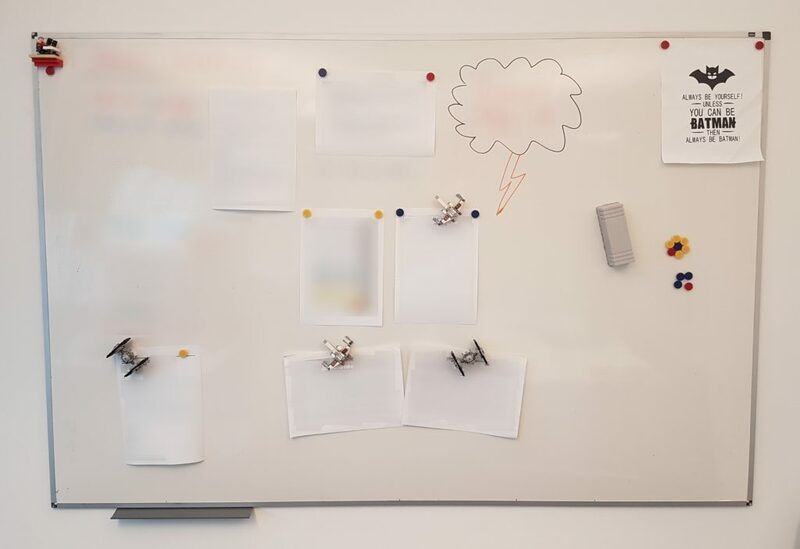 The added versatility and smaller size by itself would allow me to be more creative with future builds for my noticeboard (and hopefully for my whiteboard at work too). I will focus a lot on comparing the Mbrik with the already mentioned LEGO magnet. 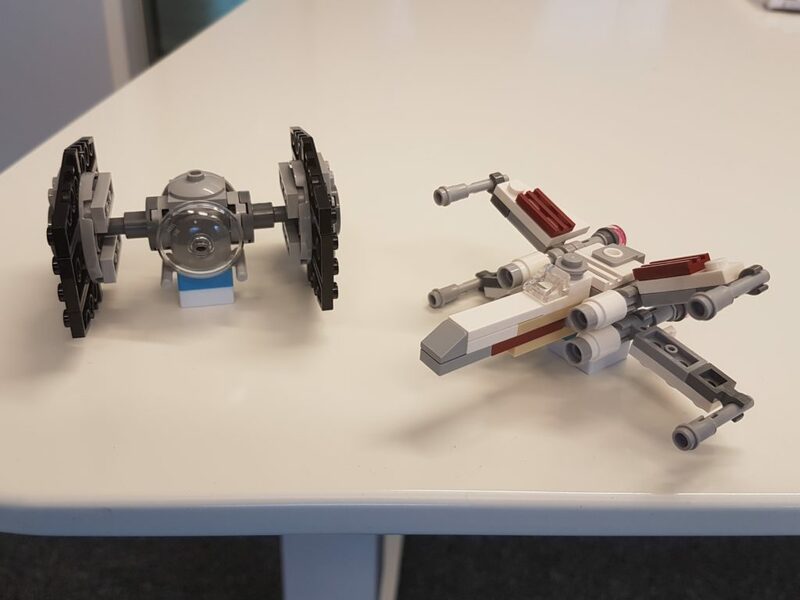 As an AFOL I always place a higher value on things made by LEGO. Third party products needs to fill a niche not covered by LEGO or be greatly superior for me to even consider them. 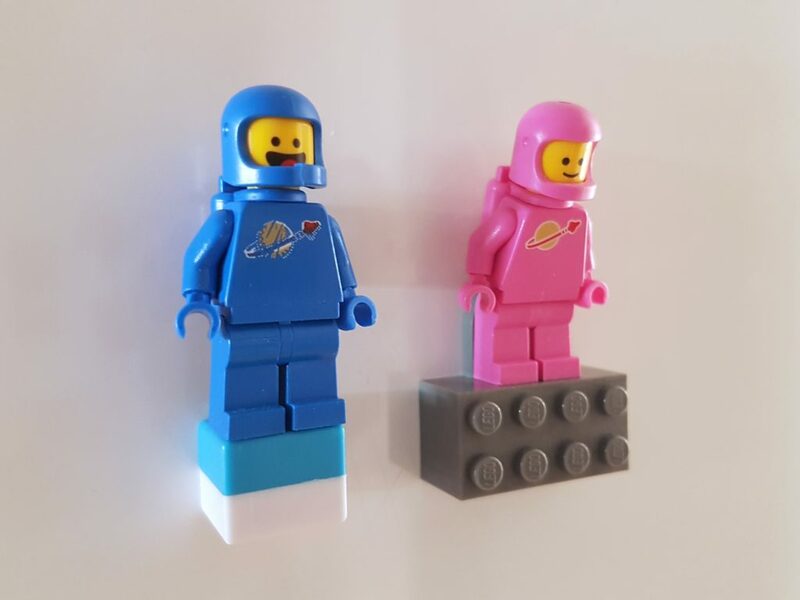 The LEGO magnet I’m comparing with is not by itself available for purchase from LEGO, but can be found in multiple Bricklink stores around the world. Mbrik is currently, as far as I know, only available from their US based online store. The LEGO magnets are priced from $0.1 and up to $2.7 on Bricklink and Mbriks are between $2 and $1.48 each dependent on how many one buys. So as it is right now, the LEGO magnet is both the cheaper and the more available choice for most people around the world. 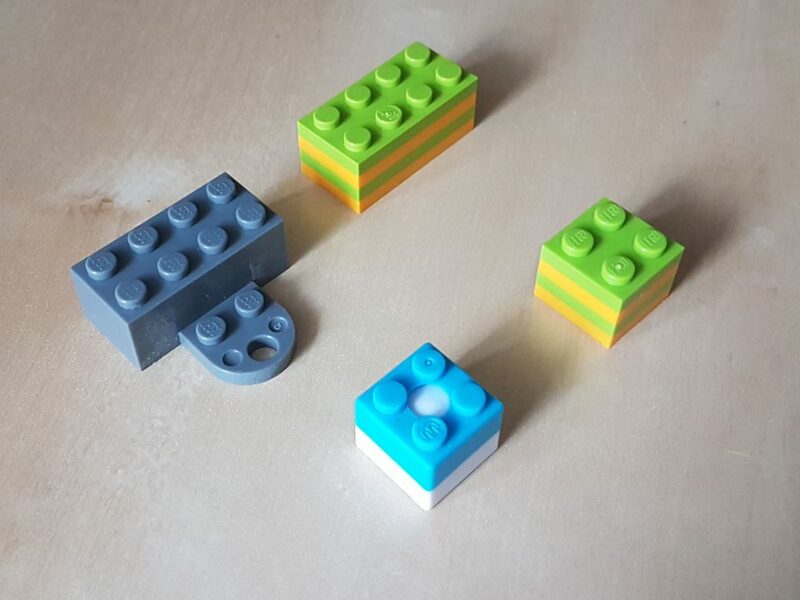 A single Mbrik is the same size as 4 2×2 LEGO plates stacked on top of each other. This is less than half the size of the LEGO magnet which is, with its protruding curved plate, a bit larger than 4 stacked 2×4 LEGO plates. The Mbrik can be placed with any of its sides against a metal surface. That’s much better than the LEGO magnet. It can only placed with its backside again a metal surface. The Mbrik has both studs and anti-studs while the the LEGO magnet only has studs (backside is completely flat). I decided to do the weight carrying capability test on my fridge. I chose it as it would likely be the most common surface anyone else would have at home. It is also a low friction surface, which means the magnets can’t support much before they start to slide. I wanted to test what is probably the worst case scenario for the magnets. If one take size into consideration, one could say that the Mbrik is more than twice as good. And with the better versatility of the Mbrik, several magnets can more easily be combined in a build. Although, It is not possible to place two Mbriks right beside each other though. That will result in the magnet connecting to each other instead of to the metal surface. The Mbriks must be spread out. Top row of bricks have the following colors (Bricklink names) : Sand blue, Blue, Dark Azure, Medium Azure, Medium Blue, Bright Light Blue. The blue part of the Mbrik magnet is closest to LEGO’s Dark Azure color. Unfortunately, it is not as close as the photograph makes it seem. I blame the camera in my mobile phone for that trickery. The white part is a bit cooler than LEGO’s white. So no colors are an exact match. Personally I would have preferred if the Mbrik was in a single white or black color. The Mbrik works great for displaying minifigs. Any minifig with anti-studs in their feets will work with them. It also has a better distance from the back surface. A minifig with a backpack can stand straight without issue. With the LEGO magnet an extra plate needs to be added as a spacer for the same result. As you can see above, poor Lenny (Pink guy) needs to bend forward while Benny (blue guy) can stand straight. 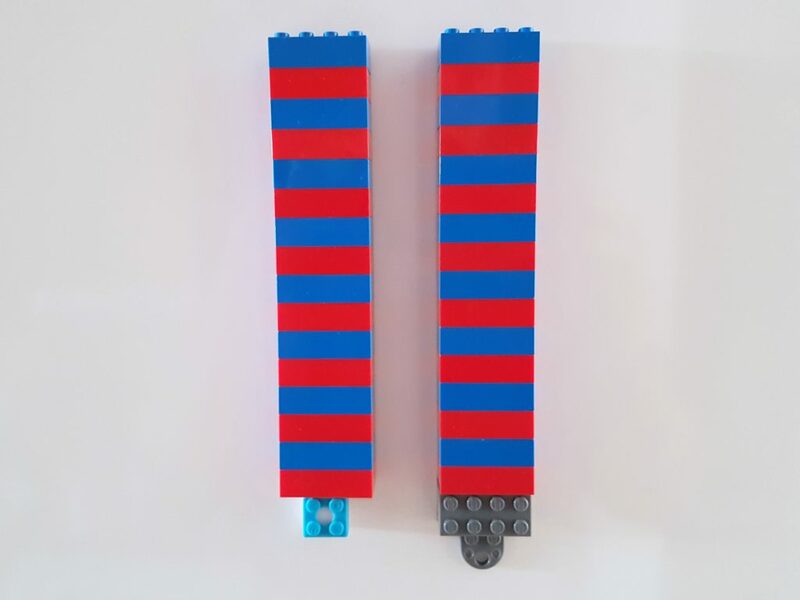 To do something similar with the the LEGO magnet would not work in my opinion. Generally they would be quite awkward to use when combining with a build. And especially when you need to keep the builds small as above. The Mbrik sits much more discreetly below them. While the Mbrik is clearly more versatile and allows for more creativity, I will still use the LEGO magnet for minifig display. Mbriks are a good complement, but not a complete replacement. I will probably not buy any more Mbriks until I find a reseller in the EU with a competitive price.